The Congressional Budget Office (CBO) today released a look at various long-term budget scenarios. Most notably, the report shows how much more bleak the long-term outlook would become if lawmakers extended recent legislation. Under the Alternative Fiscal Scenario (AFS), which assumes the continuation of the deficit-financed tax cuts and spending increases enacted in the last year, debt would increase from 78 percent of GDP in 2018 to 148 percent by 2038, compared to 118 percent under current law. By 2048, debt would be around 210 percent of GDP, compared to 152 percent under current law. Debt would exceed its all-time record of 106 percent of GDP by 2029, five years earlier than under current law. The extra debt in this scenario would reduce real Gross National Product (GNP) per person by 1.2 percent by 2038. If the tax and spending policies are extended, the deficit in 2038 would be 10.5 percent of GDP instead of 7.1 percent under current law. That deficit would be the highest in recent history outside of the deficits that financed World War II. The report also shows the effect on the budget and the economy if lawmakers held revenue flat instead of allowing it to rise as rising incomes push workers into higher tax brackets. 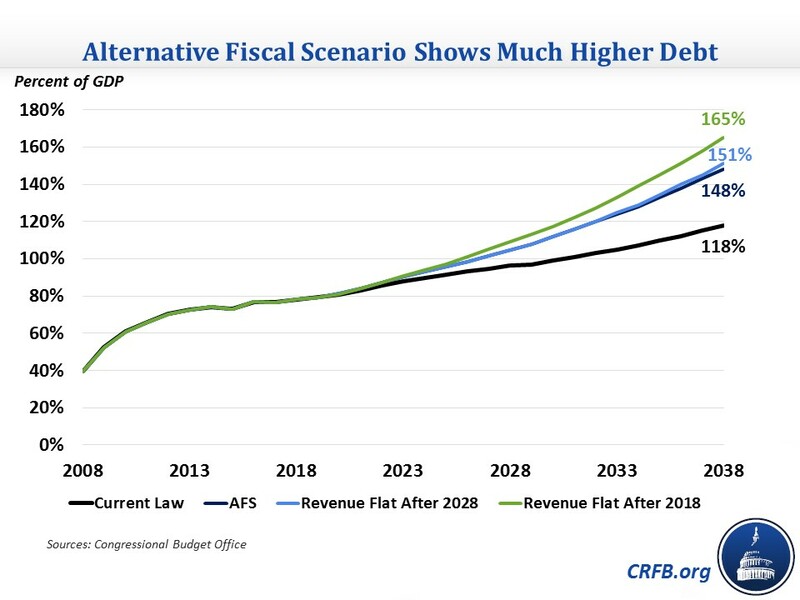 Holding revenue flat after 2028 would cause debt to rise higher to 230 percent of GDP by 2048, while holding it flat after 2018 would cause debt to reach 260 percent that year. The latter scenario would have a larger negative effect on the economy, reducing real GNP per person by 1.7 percent in 2038. We will have a more detailed summary of CBO's alternative scenarios later today.